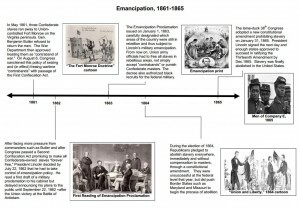 Matthew Pinsker has created a one-page timeline of emancipation that offers a useful summary of the major topics covered in this digital classroom. 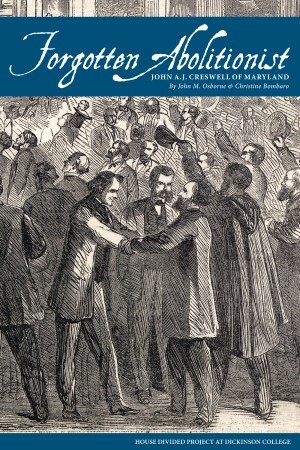 The Freedman and Southern Society Project at the University of Maryland has posted an abbreviated but very useful version of the emancipation chronology which appeared in their seminal publication, Free At Last: A Documentary History of Slavery, Freedom and the Civil War (1993). The brief chronology covers five years and provides about 75 concise entries with links to about 25 transcripts of critical documents concerning emancipation, including various military orders, congressional acts, and presidential proclamations. The project was established in 1976 to produce a definitive multi-volume series (Freedom) containing various slavery & abolition documents from the National Archives. Leslie S. Rowland is the project director. Former editors include Ira Berlin, Barbara Fields, Joseph Reidy, Kate Masur and several other leading historians of the era. Highly recommended for high school and undergraduate classrooms. By comparison, the Gilder Lehrman Institute for American History has posted a detailed timeline for emancipation that covers the period 1861 to 1877 and while it offers somewhat less access to primary sources, the website provides much greater benefit for K-12 classrooms. The presentation is easy to follow and includes not only an abundance of well-written reference materials, but also interactive features such as videos, podcasts and web-based exhibitions. Highly recommended for middle and secondary school classrooms. The House Divided Project research engine also offers clickable timelines on a variety of related major topics, including not only Emancipation, but also Slavery, Fugitive Slave Law, Uncle Tom’s Cabin, Underground Railroad, Lincoln Douglas Debates, Harpers Ferry Raid, Invasion of Maryland (Antietam), and United States Colored Troops. This entry was posted in Timelines by Matthew Pinsker. Bookmark the permalink.